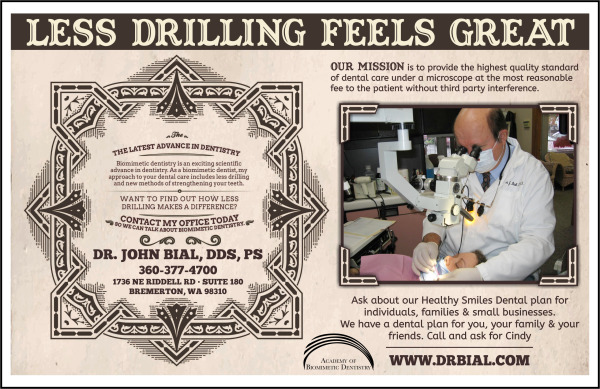 Dr. John J. Bial graduated from the University of Illinois, College of Dentistry at the Medical Center in Chicago. Dr. Bial served in the United States Navy for 24 years where he completed a Post-Doctoral Fellowship in Periodontics at the Naval Dental Center in Bethesda, MD. While on active duty, he practiced General Dentistry, Periodontics, and two years of Orthodontics in Okinawa, Japan. Dr. Bial continued his education and became a graduate of the Las Vegas Institute for Advanced Dental Studies. In 2016, while lecturing in Salt Lake City, Utah at the annual recertification training for Alleman-Deliperi Centers for Biomimetic Dentistry, Dr. Bial received the award of "International Biomimetic Dentist of the Year" in two countries, Sardinia, Italy and the United States. He has been subsequently elected by his peers to serve as president of the Alleman-Deliperi Centers for Biomimetic Dentistry (ADCBD). Dr. Bial has 3 sons, all of whom are scientists. His middle son, Nicholas, is currently completing a double degree program in Oral and Maxillofacial Surgery. In spite of his busy international lecturing schedule on the subject of Biomimetic Dentistry, he still finds time to enjoy swimming, reading, and cooking as well as restoring automobiles and motorcycles.